In order to try to get this forum lively again, let's continue the idea of a debt pay down challenge in 2018. Above is my current situation. I don't see it changing much before January 1, 2018. In the upcoming year, I would like to reduce my credit card debt back to zero so I can get back on track with paying in full regularly. As of today, the balance is $4065. I would hope to pay this off by June, at the latest. This means $678/month minimum, without incurring more charges. To do so, the biggest challenge will be not adding to this. I think the most effective mindset for me is going to be focusing on bringing in more money to pay this down, on top of my current income. It will take consciousness and some lifestyle review, but I am hoping to be able to make it happen. I would also like to focus on paying off my hospital bills from my shoulder surgery last year. Right now, there is an $1800 balance, so I'll need to pay $150/month to meet this goal. - Get the Debt Snowball Rolling! I finally got my head out of the sand this month and listed ALL of my debt in YNAB, in order from smallest to biggest. That dollar amount is split between two bills of $350 each and one of $1125 so for the nonce, this fits in nicely with my first goal. I also incurred some dental debt when I had to get a tooth pulled, again, with no insurance. That bill is recent and my dentist is a wonderful man, so I don't see this one getting shipped off to collections. - Stretch Goal: Half my Credit Card Debt! My credit card debt totals (at this moment) $7750. I'd like to pay off $3875 of it in 2018. I'm basing my post here off of the format of the 2017 Debt Smackdown. I've posted the guidelines from that post below. 1. List the amount of total debt that you owe. This step is to give you an awareness of your current debt situation. Feel free to share, this forum is a safe and nonjudgmental place. You can also decide to keep this information private, you don't have to post your total here if you are not comfortable doing so. Feel free to break down the amounts by credit card/type of debt. Also, if you have a specific plan or some ideas on how you plan to pay down the debt, you can post that too. Maybe your plan will spark some ideas for others on how to tackle their own debts! 1) The total amount of debt I currently owe is $5, 475.89. That may not seem like a lot to people with mortgages and other larger major debts but for me it is pretty significant. 2) I want to pay off all of this debt in 2018 so I can go in to 2019 hopefully with a fresh slate. This includes an unfortunate amount of debt that is in collections. These collections have haunted me for years and years and trashed my credit. 2019 will be about rebuilding my credit and putting myself in a good position to begin saving up for a house and preparing better for my future. 3) I'll check in monthly to keep up progress. My projection (Sorry Jesse - I know we're not supposed to forecast but I can't help it!!) for January 2018 is looking good so far. My monthly breakdown goal (5,476/12=456) is $456 a month and that's actually lower than what I had allocated to debt payments before I even started putting this together. I was planning on allocating 491 to January's debt payments so that was a really good feeling. I've attached a screenshot of my own version of the graph tracking my debt that I modified from the 2017 Debt Smackdown page. Having a visual reminder of my progress is really helpful and encouraging. That's all for now! Thanks for anyone who kept up with all this. Also - if anyone has tips for handling collection companies I will happily take any and all advice as this is the first time I've taken my head out of the sand and tried to deal with them and I'm very scared to do so. I know it has to be done but it's very intimidating. Thank you everyone! We don't have much leeway on payments and the main bulk of that is our mortgage, we can't really downsize, we've looked into it and financially it's not worth it after we pay all the fees for moving we'll have a mortgage that is similar but a house worth less money, and with 4 kids it's not like we can squeeze into anything much smaller than what we are already in anyway. Our house isn't massive or flash we just live in a really expensive country, I see US mortgages and feel quite jealous, you can't buy anything here for what a lot of people in the US have a nice house for. Credit card 2 $3319 at 19.99% this is the one we will target. Like I say we don't have much leeway at all on payments so goal is to pay off half of credit card 2, stretch goal would be to pay it off completely (maybe possible if I get more work than expected next year). PhoenixFlying Oh my goodness I get you on the NZ mortgages and house prices and what we get for our hard earned dollars! Our mortgage is $515k and it really plays on my mind - like you, we have 5 kids and downsizing at least here in Auckland sadly isn't an option. My debt total is currently hovering just under $65K. Oof. So I'm saying my official 2018 goal is $25,000 towards debt paydown. Stretch goal $30,000. For the time being at least I'm going to try VERY hard not to stress about how little of that is going to pay down principal, and how much is getting sucked away as interest (*cries*) - but maybe by this time next year I'll be in a better position to negotiate some better rates and/or pull off some low interest balance transfers? *fingers crossed*!! TOTAL Debt: $65,029.86 - across 12 credit accounts. Oof. Not going to even post the rest for now so I can stay focused and not discouraged, but will post more as things progress! How do I get the spreadsheet mentioned. I’m keen to join but wondering if I am misunderstanding. Do I set it up myself or is there a group one? Opportunity Knocks I got the spreadsheet from the 2017 Debt Smackdown page and took the spreadsheet that had been made over there and heavily modified it so that it was only tracking my information. I've linked the spreadsheet below and the link to the old thread above. Amanda thanks so much. I’ll do the same as you have. Opportunity Knocks Not a problem! Feel free to let me know if you have any questions. Our current debt is about $23k. I'm not even including mortgage or student loans because my wife is in school, so we're on one income and accruing more student loan debt as we speak (sob). My goals are to pay down consumer debt while building our emergency fund and savings, since our margins are thin. 5. Stay on top of everything else without accruing additional debt. My current debt is a little over $100K. The majority of it is student loan debt (about $78K) and the remainder is consumer debt. I currently have a chunk of my consumer debt in a free debt management plan through my credit union. The total debt that isn't wrapped up in the plan is approximately $10K. I want to focus my debt pay down efforts toward reducing the $10K. I have three open standard cards now with balances between $600 and 800. I want to pay them off first, especially since two of them have terrible interest rates and fees. The sooner I can get rid of those cards, the better. I'll even accept the penalty for closing the accounts. They total about $1500 together. That makes $6100 my target pay down for 2018. Our goal is to pay off all of our debt except our car and one student loan, so about $17,500. It's going to be a bit of a challenge because we're expecting in March so currently in "Stork Mode." Once things are back to "normal," we'll be hitting it hard! Looking forward to this challenge and getting things knocked out! Our stretch goal is paying off the last student loan as well, which is about $7500. We are also planning to avoid taking on any medical debt by paying cash for our share of labor and delivery. newlywed24 Having the cash on hand to deal with those medical bills is huge. Good luck and safe delivery! ClimbingOutOfDebt thank you! I'm hoping we have enough. Good luck on your journey! This is my third challenge! In 2016 I paid off $10,000 in principal, then $30,000 in 2017. My remaining debt: $89,200 in student loans - I started with $130,400. This year I want to pay off $40,000! Veronika getting $40,000 paid off in one year would be a monsterous feat. I have $50,000 in debt which consists of $20,000 in student loans, a $15,000 auto loan and the rest is credit card debt. My goal for 2018 is to pay off $7500.00 in credit card debt while continuing to make minimum payments on student loans and the car loan. I have attempted YNAB several times in the past and have never completed a full 30 days. This is the year I plan to break that cycle and get serious about my debt! Sticking with it in the beginning is the hardest part. The hole looks so deep that it’s intimidating to get started. Stick with it and I’m 2-3 months you’ll start seeing the progress and sticking to the plan will seem easy. 4. Fully fund all categories in YNAB - I'd like to be able to do this by the end of the year. I have all of my categories set, but I've yet to fully fund them according to my own plan. I need more income and less debt repayment in order to do this, so I don't expect that I'll get to this one until the end of the year. I know number 4 above doesn't seem like a debt repayment strategy, but it will function as a marker that I have changed from paying for expected expenses via debt (short or long term) and have shifted to being able to put money aside for those expenses. 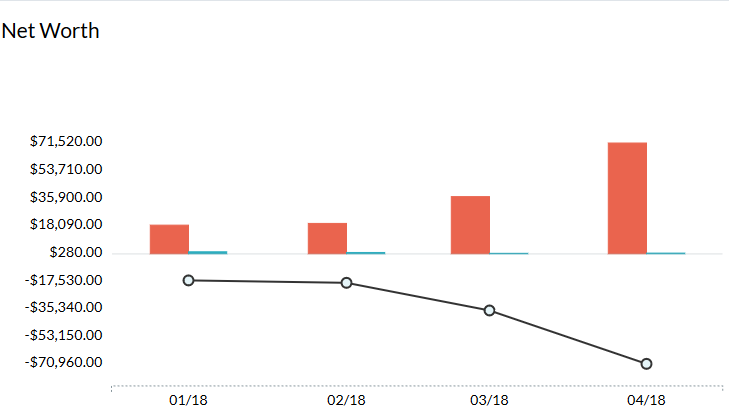 I'm in my second year with YNAB . The first year was all about coming to understand what money I had and how I was using it (that was a very eye-opening year - all of those messages from YNAB saying that process would take a month were completely unrealistic for me). The second year is about increasing income and paying down consumer debt; and the third year (my YNAB year begins in August) will be about shifting focus toward putting money aside for expected expenses. Once I get those things done I'll look at that HELOC, which is rolled-over consumer and house repair debt. If I could get that monkey off my back I'd be happier - but the autopay I have set up is just $110.75 per month so I'm not tackling that beastie in 2018. Looking forward to being part of this group. I often feel alone in this rather plodding process of debt repayment. We do not have a ton of wiggle room and my oldest son will be graduating from Marine boot camp (God willing) in December 2018. We are traveling to Parris Island to attend graduation, so cash flowing that. With a family of 5, one child in college, one a senior and one a freshman in HS, there are a lot of miscellaneous expenses. Daughter in college does not have a food plan, so we pay for all of her groceries. My senior will be having a small graduation party/going away party. 3. Snowball debt, starting with credit cards. I am hoping by March/April to be paying an extra $500. 4. Fully fund all categories in YNAB. This is starting in January. My Miscellaneous Income Adventures will be kicking into high gear, besides working extra hours at work. At least the credit cards and start on the HELOC. We may be refinancing our mortgage in the spring for a lower rate, so that is in flux right now. I am in! We are starting 2018 with $39,682.65 in consumer debt. Our goal is to pay off $20,000 in 2018. It will be a stretch for us but we are ready to kick this debt to the curb and move on with our financial goals. Here's a helpful resource for figuring out how to pay down multiple debts! 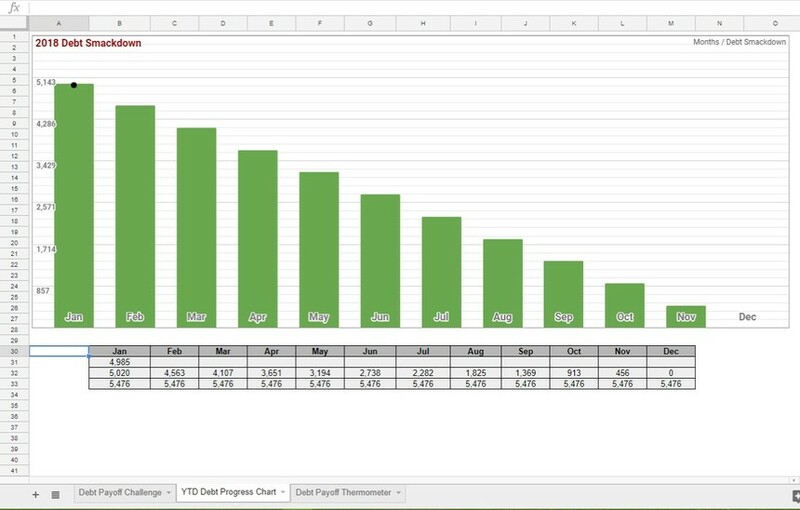 It's a free spreadsheet, and they have a video showing how to use it, too. You put in your various debts with their interest rates and minimum payments, and then enter how much you can afford to pay toward debt reduction. Then you select what type of payoff method you want to use and it calculates how much interest you will pay using each method. Ideally you want to go with the method that will save you the most interest, but some people prefer to go with paying off low balances first in order to get the momentum going and/or free up funds to put toward a high-balance debt. So it's completely up to the individual. 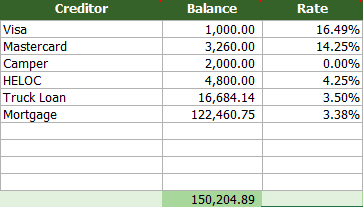 The spreadsheet isn't fancy, but it helped me IMMENSELY over the last 2 years when I finally decided to get my car paid off so that we could put more money toward our home loan and start a savings for a new car (which may not come for a few years, but I want to have a good down payment ready whenever that inevitable expense happens). Having the chart is also a nice reminder of your goal and how sticking with it will be worth it! We owe just a little over $150,000, including the mortgage. My first goal is to pay off the Visa card, then the Mastercard. We also set aside $333 per month towards a 0% loan from my parents for our RV, which I pay them back at $1,000 per quarter. I want these three debts paid off by Fall 2018. The HELOC and truck loan will take a few more years, and the mortgage is obviously a long way off. I wish we could not add any more debt before these are paid off, but the dog we recently adopted is heartworm positive. We'll be paying about $800 for her treatment, which we have to put on a credit card. We also would really like to do a chain link fence for our dogs, one of which really needs to run for exercise, but he won't stay with us. He keeps taking off and it takes us at least 30 minutes to track him down. He needs a place where he can run his energy off while still being contained. This expense would have to go on the HELOC. % of the way to our goal!!!!! A little late to the party on this, but better the proverbial late than never! My goal for this year is to eliminate the credit card debt, with a stretch goal being to make some headway into the auto loan . Pretty good January! As of Feb 1, I have decreased my debt down to approximately $12,194.